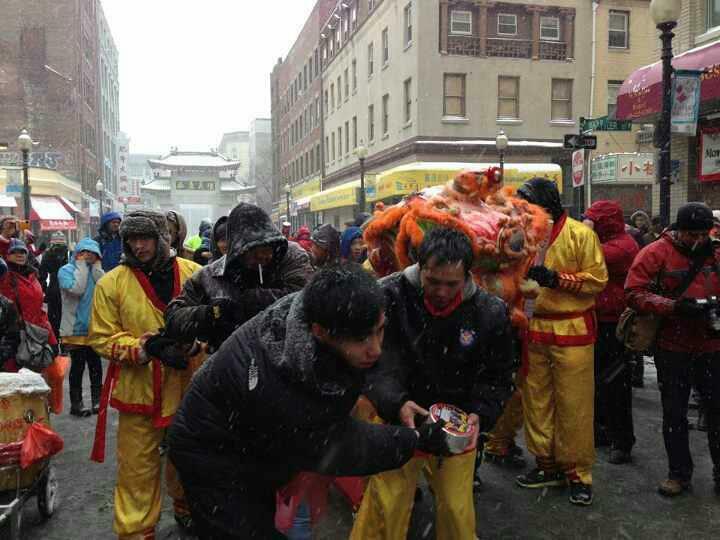 This Sunday, the day of the big parade in Chinatown, is supposed to be the coldest day of the year. So here are some tips from a seasoned Lion Dancer. Just because it looks like I'm only wearing a silky Pajama like Ronald McDonald Uniform does not mean that's all I'm wearing. I'm the guy in the bear hat and I have a T-Shirt followed by a sweatshirt, followed by a sweater, followed by a jacked and then the uniform. For pants I have the under wear, the jogging pants, the swishy pants that don't let in wind, and then the yellow Kung Fu golden like pants. For shoes I may be wearing winter boots. As a young man I did not like the winter boots. In fact living in Chinatown I simply did not need them. I often wore Wui lik (wu li?) China style volleball/soccer/Kung Fu shoes on Chinese New Year... and just around in general. These got wet so I would wear wollen socks, so even if I had wet feet, I had warm wet feet. Unless you are a young jumper planning on doing Lion Kings throughout the day (which is ill advised this year since it will be super cold) I suggest the boots. And even if you do the Kung Fu shoes, if you have parents or friends or a pit stop, plan for a change (if your team can afford it.) We are one of the smallest teams (if not the smallest team) out there, and having one person change his shoes so that he can better particiapte will help the team more than hurt it. But don't plan to take the layers on and off. In year's past we hgad a cart to put coats and oranges and water etc. But in terms of hydration, just eat the oranges and the tangerines. That way you get electrolytes too. Eat them even if you don't feel like it just so you don't end up dehydrated. As for having to be sweat it out. But I'm moving around I'll get over heated especially going in and out of restaurants, hot col hot cold hot cold. That's right. So basically I wear enough layers so I am always warm. Remember there is a whole section by the stage where you will stand there waiting for the other teams. You won't be moving. You are going to be freezing. The Lion Dance Parade is not a marathon, or an hour of working out outdoors. It is six hours and a good amount of it is just standing around, follwoed by quick bursts of lion dance, and then more standing around. When you are drumming or playing instruments, as far as your body is concerned, that is standing around. So you have to be warm for that. Now I don't wear a heavy coat. I wear a light jacket, with a sweater and sweatshirt underneath. It is also probably a goo didea to have a change of clothes for AFTER the dancing is over. But expect to where the same thing all the way through. Remember, in terms of strain or real athleticism, Lion Dance is probably not as difficult or extreme as mountain climbing or skiiing. Not that I do those things. I just do lion dance. But if you dress warmly and remember to get fluids, (the easiest way is eating the oranges) then you will be a lot happier than if you tried to do it in a T shirt. We had kids that did that some years. But just for a short period of time and they had their mothers to hold their coats for them. Don't forget to wear ear plugs. I recently filmed Hung Ching doing an opening so the firecracker part was unexpected. At the same time, since I was holding a camera I couldn't cover my ears. It affected me for a few days. Ear plugs are essential. I would say even spectators should wear them If you want to get close. Dress warm and wear layers but maybe don't have an expensive outer layer. Why? The firecrackers do sometimes blow holes in clothing. Plus layers can protect you from that. Granted you will not be as close as the lion heads but still. Spectators will not be jumping around so you can always dress warmly. But most people don't... because they can always also just go inside a restaurant to eat, and maybe you don't want all those layers to have to take off and be a hassle while you are dining. This year there is also a little activity center at 2 Boylston put on by Mainstreet. That will be good for little children who are tired of the lions, or scared, or whatever. The teams still come in and do the Lion Dance for Gund Kwok which is housed there, and of course... Gund Kwok is also housed there and will do lion dance for themselves.